I already blogged about Mark Luetke‘s awesome Motherblogs Made Easy plugin, and I promised there was more. Well, here’s more. 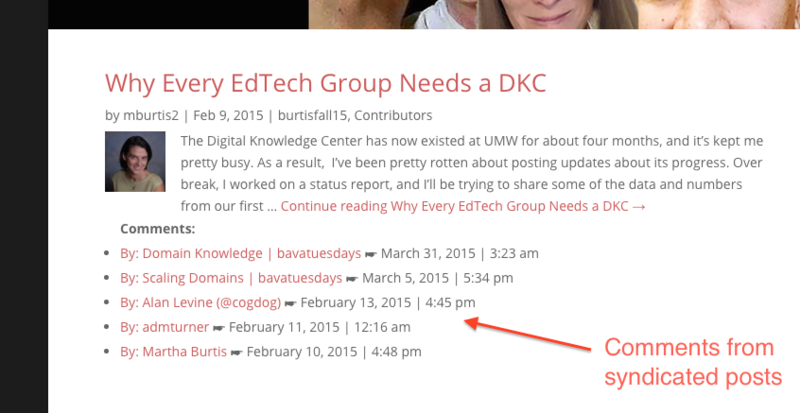 Martha Burtis already experimented with Mark’s List Remote Comments plugin on the aggregator blog she is working on for Freshman Seminar she will be teaching (along with several other UMW faculty) titled Beyond the Selfie. It’s very slick, it basically takes the comment author, post title, time and day, and links that right beneath a post excerpt. In fact, Mark is building on top of the Remote Comments plugin that Martha wrote a while back which shows the number of comments on a syndicated post. 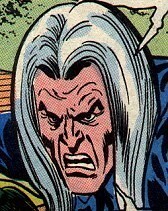 Mark took that code and actually pulled some meta data and a link to those comments right into the post. All of which makes the syndication hub that much slicker. I wanted to try this out for myself, and Martha was kind enough to share the bit of code she used as part of a custom WordPress function for Beyond the Selfie, which I added to functions.php of the theme for the gorgeous Prisoner 106 site designed by Andrew Forgrave. This is a syndicated motherblog using FeedWordPress, so having the remote comments show up on the aggregator of the various syndicated posts is most useful for folks who want to see what’s happening at a glance. I failed to mention that both Mark’s and Martha’s plugins depend on FeedWordPress to work. 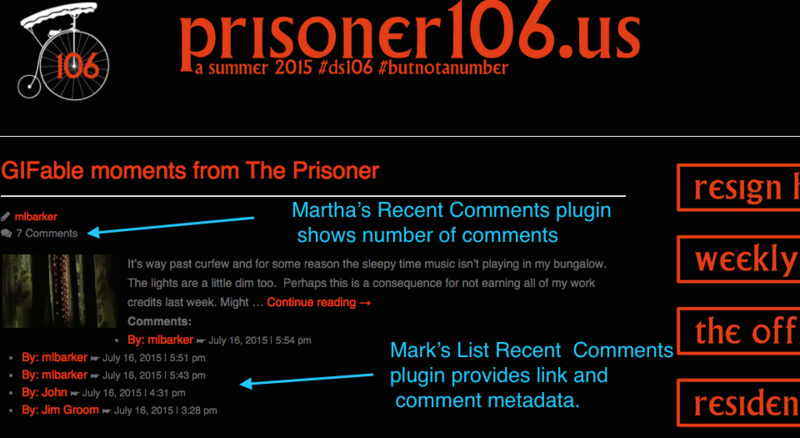 For Prisoner 106, I tried using both Martha’s and Marks’s plugin to show the number of comments on a remote post as well as providing a list of links to those comments beneath the posts. Pretty cool mashup of the two. This entry was posted in digital storytelling, WordPress and tagged comments, ds106, Mark Luetke, Martha Burtis, plugins, prisoner106, syndication, WordPress. Bookmark the permalink. Most cool! I wondered what you were up to, and the list_remote_comments is awesome! A wonderful addition! I must say I’ve been most impressed with how well FeedWordPress and the add-ins work together with WordPress to make this operate so smoothly. WordPress is a wonderful platform for customizing and manipulating the bits just so. I’ve been working with the Gantry Framework and Theme for 3 or 4 years now. I like the way it provides considerable power, but lets you build stuff up as you need it. Thanks, again. #BeSeeingYou in The Village.